I know you are shocked...SHOCKED to find that I am a voracious reader. It is true. I especially love to read books about things. Some people would say that they love to read books about ideas, but reading books about things IS reading books about ideas. People who create things, generally create them because at some point they had an idea. Ideas that result in things intrigue me. One of my favorite things to read about is color and my favorite color book is Mauve by Simon Garfield. 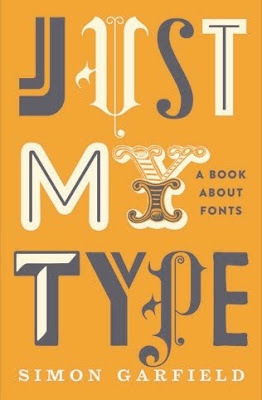 When I saw that he had written a book on type, well I simply couldn't wait to get a copy. It came from England so I waited and waited, but it finally arrived. Last night I was reading with the television on. (Let me say here that not only do I read a book nearly every day but I also watch television every day, so don't go all "I don't own a TV" on me.) A show called The Middle came on. It appears an hour before Modern Family. Modern Family is the darling of critics, but I believe The Middle is much funnier. The fact that Modern Family is set in California and The Middle is set, well, in the middle, may just have something to do with it...but I digress. The Middle features a popular sitcom trope, the weird, diminutive child who seems to have been dropped from another planet. In The Middle, that child is Brick, who is a voracious reader and lost in his family of underachievers. His father tells Brick he should learn about sports because, "If you know about sports you can talk to anyone." So, of course, Brick learns everything about sports and then everyone hates him. That was a long set up to tell you that even on mindless television sitcoms, fonts are important -- and way more interesting than most sitcoms. Of course, with Simon Garfield writing about them, fonts become magical. Just My Type begins with a lecture about signs at Reed College that had once always been done in calligraphy and how a college drop-out became interested in calligraphy. So interest that when he built his first computer, Steve Jobs gave it the unprecedented ability to change fonts. Throughout the book you will meet a wide variety of artists, some you have heard of and some you will want to become acquainted with. There is Eric Gill, William Morris, Beatrice Warde, Zuzana Licko and Matthew Carter. Carter has trouble watching movies because he is always finding font inconsistencies. In Chocolat, a film set in 1950's France the mayor posts notices in ITC Benguiat, a font that appeared in the late 1970's. In Dead Men Don't Wear Plaid, set in the 1940's, the cruise ship brochure in printed in 1970's Blippo. I wouldn't want to go to the movies with him, but you can't fake such passion. This is the best design book in recent memory. Trust me, you will be hooked from page one. And as Brick would say, you can talk to anyone when you know about fonts. I love fonts and typeface. In architecture school in the 70s, it was all about Helvetica Medium. I almost caused a conniption when I first used Times New Roman. Now Bodoni is probably my favorite. Awesome book! i've never read something as useful as this before!